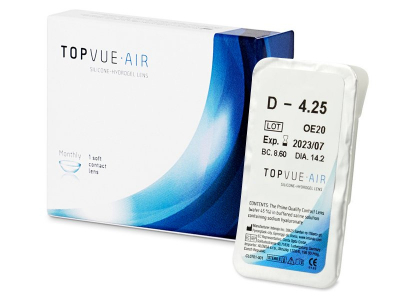 TopVue Air are advanced silicone-hydrogel contact lenses with a monthly replacement schedule. Their unique design ensures high oxygen permeability and exceptional comfort. This package contains one single lens. TopVue Air are the latest generation of silicone-hydrogel contact lenses from Topvue. These monthly lenses offer a high water content and significant oxygen permeability to maintain moisture and breathability throughout the day. Their innovative lens design and technology guarantee comfort and clear, healthy vision. This package contains one lens. 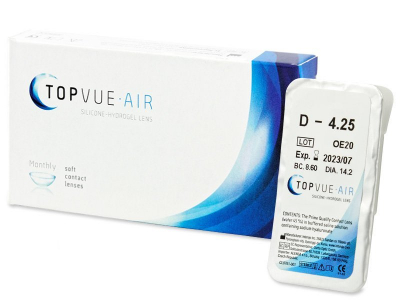 Read more about Topvue Air contact lenses. Very comfortable lenses. I will be back to order the larger quanitity. Cheap and effective delivery, also. Super service! Fast and effective. Very pleased with the entire experience. Good comfortable lenses. I like the topvue brand, and the prices are reasonable. I bought one of these as a replacement, and was thrilled. very comfortable!